Are you going to get married soon? Have you picked the color of your wedding dress yet? You know that wedding ceremony is a joyous occasion which only happens once in a lifetime. So, no wonder if the wedding dress is one of the most important aspects of a wedding especially the choice of colors as it is seen as a symbol and a sign of your marriage. If you're feeling so much depressed to find the wedding dress of your dreams that you think you may be going crazy, don't worry as we're gonna help you out. We give what we can. Do you know that the trend for colorful wedding dress is still ongoing and even gaining ground?According to Relaxnews, colourful element has been chosen by brides today to break the tradition or to convey creativity and originality for their big day. the trend of colors for grey, purple, pink and blue are highly in great demand, this is because brides-to-be are often motivated by the desire to be and look different on their meaningful day. A beautiful Malaysian actress, Anzalna Nasir, wore a wedding dress inspired by Barbie Mariposa. It is designed by Teuku Putra Aziz Cosry, the silk material was handpainted with a dash of Swarovski glittered by Alia and Ijart Emir. Our very beloved Malaysian singer, Siti Nurhaliza in a pink and white Micheal Ong Creation and pink-dipped veil to match. Shenae Grimes wore a floaty, black halterneck Vera Wang. 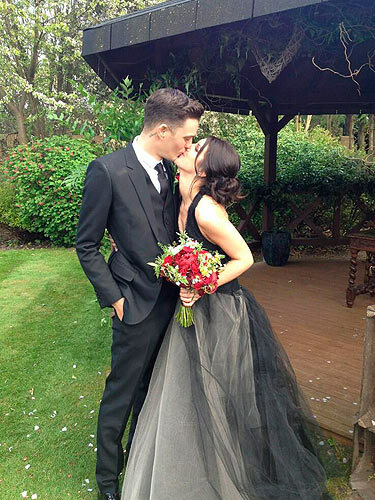 She completely snubbed the traditional white gown! 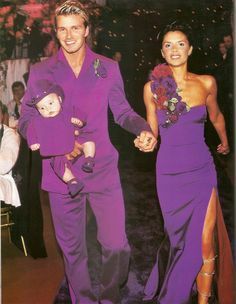 Victoria Beckham wore purple wedding dress made by Antonio Berardi. Simply gorgeous! Stacy Anam, A Malaysian singer wore a pretty royal blue wedding dress designed by Raffiey Nasir as a symbol of power, importance and wealth. However, white still remain the perfect choice for the most of brides-to-be who favour the pure look for their biggest day; as a signifier of a new life.